The secret of the success of the wines from this beautiful vineyard is found in the surrounding soil. It is rich in marlstone; a lime-rich mud containing significant amounts of clays, and silt and the sand and gravel allow for excellent drainage. The vineyard prides itself on storing water reserves for the summer, so that the vines reach optimum ripeness with those all-important polyphenols popping with perfection in the unique taste of the wine. The dry breezes from the Gennargentu Mountains provide an essential means to combat the summer heat and create a large temperature difference between day and night for the best health of the grapes. The vineyards reach an altitude of 370 metres above sea level, containing both red and white varietals. The bio-integral philosophy of the estate bans the use of pesticides. Everything about this vineyard is organic and the estate’s founders Artemio Olianas, Stefano Casadei and Simone Mugnaini insist the vines can be grown naturally due to the sloping vineyards, warm sunshine and cooling winds which obviate the need for pesticides. The harvest is also strictly manual, with the selection of grapes handpicked in the field. Fertility is also maintained through organic fertilisation using the dung from the estate’s carthorses horses and green manures. The vineyards are still ploughed by these horses, which also double up as weed eaters. Geese are also part of the biodynamic workforce employed to tend the vines by consuming weeds between the rows and lower leaves, allowing air to circulate around the clusters for optimum development. The three main red varieties of grapes grown on this vineyard are Cannonau, Sardinian Bovale and Carignano. They thrive here surrounded by the natural amphitheatre of the landscape which provides the most sheltered and warmest vineyards. There are two varieties of white grapes grown on the Olianas estate, of which Vermentino accounts for 75% and Masco the remainder. One of the coolest things about Olianas is that they use clay amphorae in their winemaking techniques. 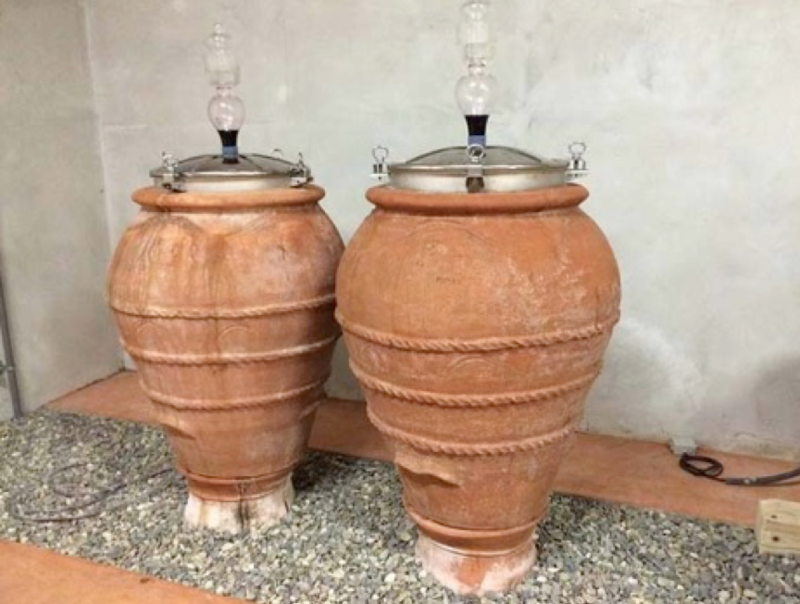 The ancient Romans and Greeks used these large clay pots for fermentation , and now modern winemakers are following in their footsteps. 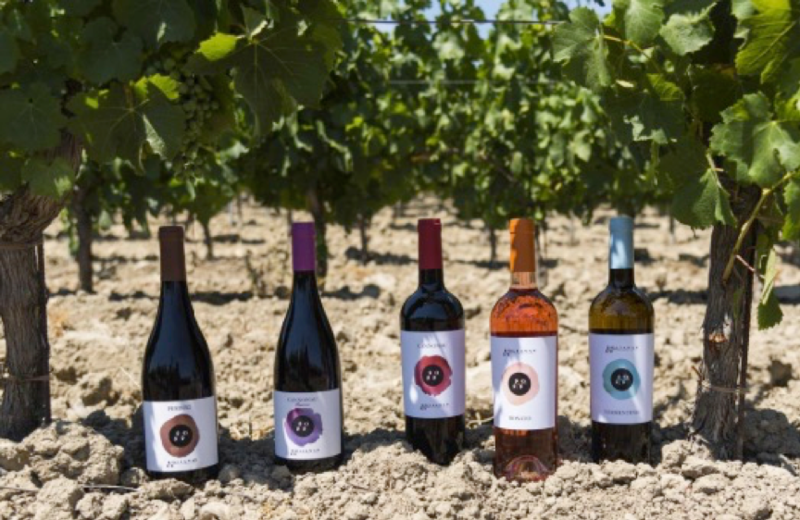 The use of amphorae works in harmony with Olianas’s bio-integral philosophy as it allows minimal intervention and a natural approach to their winemaking. These amphorae are used both above ground and buried in the earth. They are porous and essentially egg-shaped vessels into which the grape juice (in contact with grape skins, stalks and pips) is poured and then sealed. The juice is then left to ferment into wine. Ageing wines in earthenware has been shown to have incredible benefits. The porosity of the clay increases the oxygen exposure to wines while they age. Oxygen accelerates the tertiary flavour development which includes softening tannins and increasing aromas of nuts, baked fruit, and chocolate. The amphorae method comes out of a traditional, labour-intensive approach to winemaking but, these clay pots are becoming more popular at wineries all over the world, from Sicily to Burgundy to Chile and California. Moving southwards from Gallura, into the heart of Sardinia, you will enter the realm of the Cannonou grape. It accounts for a staggering 20% of the island’s wine production and is arguably the most famous of Sardinia’s red grapes and the most cultivated. Cannonau is the local name for Garnacha (Grenache)–a popular Spanish grape–however, new research reveals that Garnacha/Cannonau may have originated in Sardinia. It is certainly the most typical grape in the province of Nuoro, where you will find the most noted Cannonau di Sardegna sub areas; Oliena, Nepente di Oliena and Jerzu. Cannonau makes powerful, full-bodied wines of robust structure with a with a high alcohol volume due to the long ripening process of the grape. It can be produced as a single varietal or due to it’s low acidity Cannonau can be vinified with other indigenous grape varieties to improve balance. It’s the perfect grape for blending as it adds body and fruit without adding tannins. It has a soft acidity with generous fruit flavours of raspberry and strawberry, alongside more floral and spicy notes. The law in Italy states that this Sardinian D.O.C. wine, Cannonau di Sardegna must be 99% local Cannonau (Grenache). Cannonau di Sardegna D.O.C can also be produced in a riserva style, which is made within strict regulations controlling minimum alcohol levels and ageing times. It must be a minimum of 13% alcohol. Intense dark red berries and tobacco linger on tasting, while notes of chocolate and coffee are reflected in the wine from the ageing process in oak barrels. 66% of wine produced from Sardinia’s vineyards is DOC and/or DOCG, which is the quality system used to classify wines in Italy. When you see the letters DOC (Denominazione di Origine Controllata) on an Italian bottle of wine it means that the wine comes from a well-defined region in Italy and is produced in accordance with a regional winemaking style with specific grapes that preserve local traditions. This wine is made from 95% Cannonau and 5% Tintillu grapes. After pressing pressing 30% of the must obtained is transferred for fermentation into the buried 1000Hl amphorae where maceration on the skin lasts for 20-25 days. The remaining 70% of the must is fermented in stainless steel tanks at controlled temperatures. Fermentation takes place without the use of enzymes or selected yeasts. Secondary malolactic fermentation by lactic acid bacteria and ageing of the wine lasts for 8 months taking place partly in 2nd and 3rd use French oak barrels and partly in stainless steel containers before being bottled. This stunning wine is packed with concentrated red berries with hints of dark chocolate and tobacco. It’s a pure, classy refined wine with settled aromas. The Cannonau grapes harvested from the sunny sheltered southern slopes in more clay soils certainly add fruit, complexity and structure to the wine. Kept in French oak barrels, the Cannonau is a beautifully full-bodied wine with wonderfully balanced tannins. Raspberry, herbs, and sweet spices are prominent. Cannonau tends to be reductive, therefore, this variety does better ageing in large oak barrels that can maximize micro-oxygenation while minimising the amount of wine in contact with the oak (minimising oak flavours and imparted tannins). The Cannonau from Olianas is best enjoyed within 5 years of its harvest. This wine is made from 100% Cannonau grapes and the fermentation process takes place entirely in the clay amphorae. The product is an incredibly powerful and fullbodied red wine with intense aromas of red berries, spice and cocoa. The hand-picked grapes from the South West Ruina Figu vineyard with clay loam soils, provide a bold structure and complexity to the wine. Following the de-stemming process, the grapes undergo a light pressing. The must is then buried in 10Hl clay amphorae for the fermentation process. Maceration lasts 30-60 days with manual milling of the cap of skins that forms on the top 2-3 times a day, which causes more necessary rotation during this fermentation process. The wine is then poured in to amphorae situated above ground, in a heated place, for secondary malolactic fermentation. The wine is aged in French and Slovenian oak barrels for 20-24 months, followed by 5 or more months in the bottle. On tasting this robust wine offers rounded tannins with well balanced acidity for a long rich finish. The riserva has the aging potential for up to 10 years. This is one of the estate’s flagship wines. It’s a red blend of 75% Bovale and 25% Carignano. After de-stemming and light crushing, the Bovale is poured in to 10Hl buried amphorae for fermentation. The Carignano is vinified separately in stainless steel tanks without the use of enzymes or selected yeasts. Aging takes place partly in 10 and 20 Hl barrels and partly in new tonneaux for 12-15 months. The wine is then continues to age in the bottle for another 6 months. The Perdixi has a mix of black fruits on the nose in alcohol, combined with a hint of licorice and vanilla bean. It is an extremely elegant wine with balsamic flavours on the palate and thick, well blended tannins. Olianas also do a delightful Rose which is 80% Cannonau grapes and 20% Vermentino. The soils of the Vermentino vineyard are heavy in marlstone giving the wine complexity and structure. The sandy soils of the Cannanou vineyards used in the production of this product give the wine elegance and freshness. The Cannonau and Vermentino grapes are immersed for a few hours in the press in contact with the skins and then transferred into 50 Hl stainless steel tanks where fermentation takes place for one month. After fermentation, 80% of the wine is matured "sur lie" in stainless steel tanks for 5 months, while the remaining 20% is aged in Tonneaux for the same period. The wine is then clarified and undergoes a light filtration. The Rosato is a fresh and lively wine with great impact. It has the perfect balance of the freshness of a phenomenal white wine with the structure of Cannonau. It’s perfect as an aperitif and goes beautifully with shell fish.